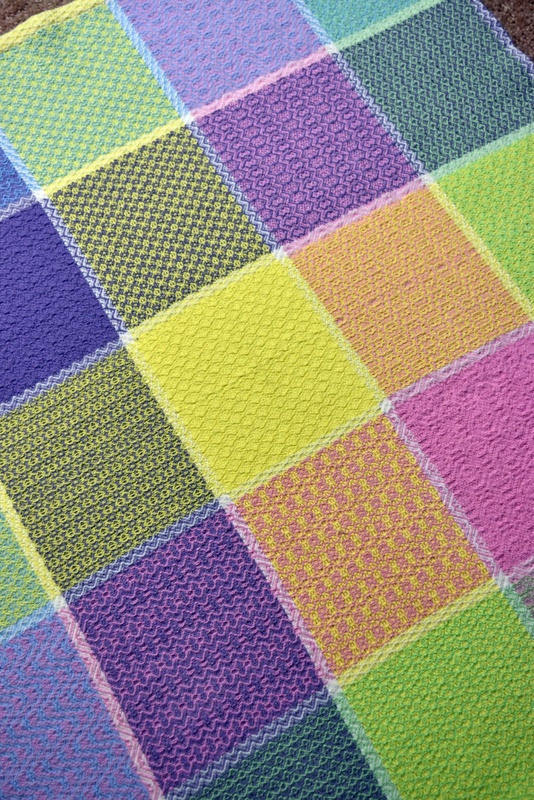 One of my former weaving teachers, Madelyn Van der Hoogt, used to say there are two kinds of weavers: color/texture weavers and structure/pattern weavers. 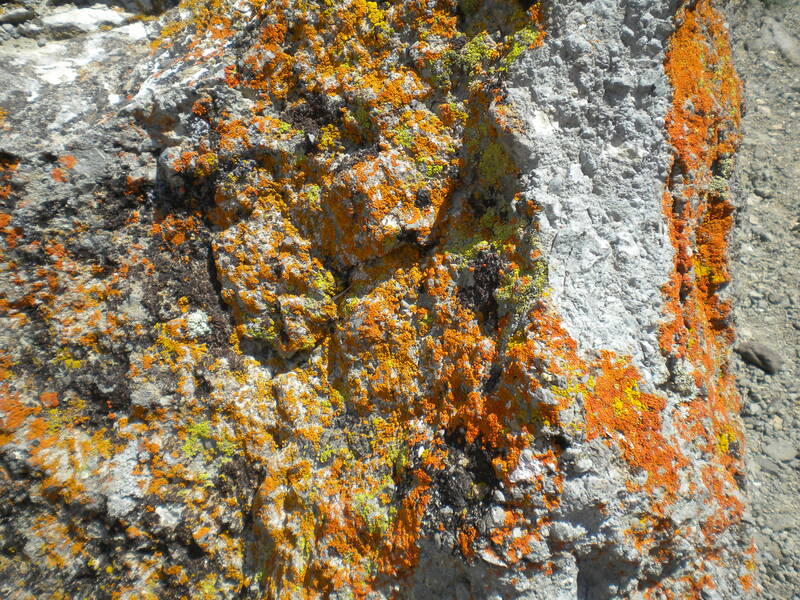 The color/texture people are drawn to – well, color and texture. 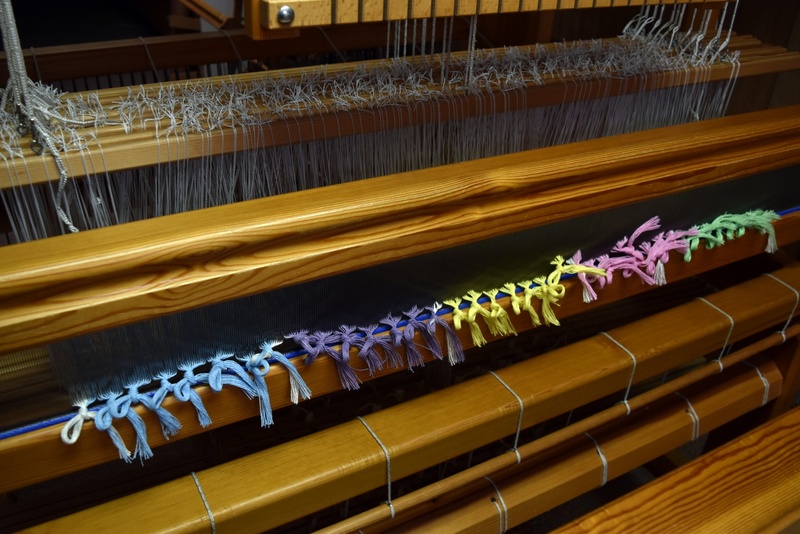 Their projects bump and bubble with shades and hues, delighting the eyes with a virtual flower garden on the loom. The structure/pattern weavers gravitate towards those intricate interlacements that take the yarn in elaborate diamonds and laces. 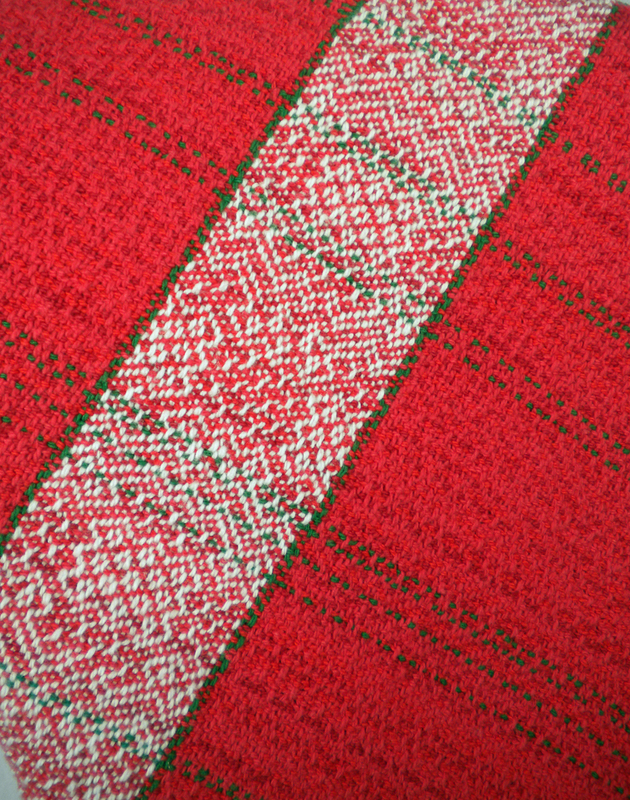 How do you get the strict grid on the loom to softly curve in the design? Hmmm. I hadn’t thought of myself as being so far to that end. But as I scrolled through my weaving pictures, it’s obvious. While I do dabble in color blending and like a bit of texture in my towels, those fancy diamonds and stars show up over and over again. 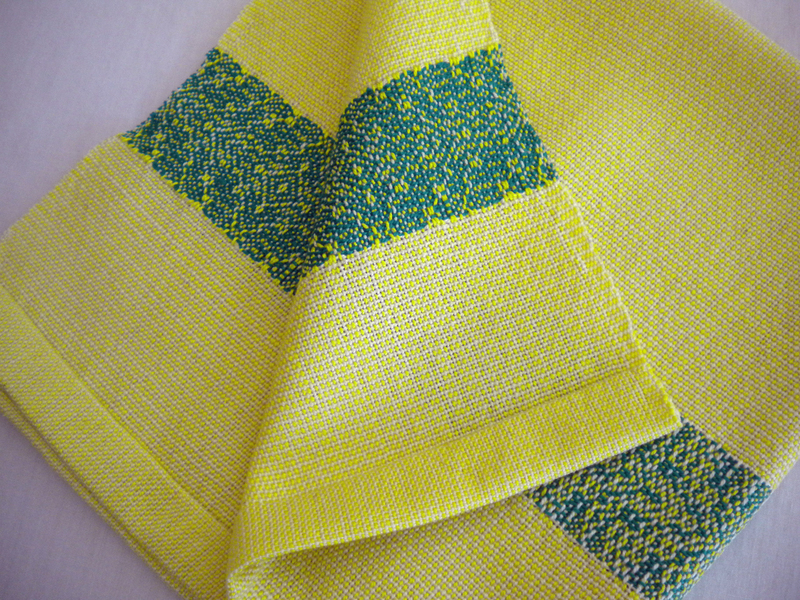 The lemon napkins with a green twill border. 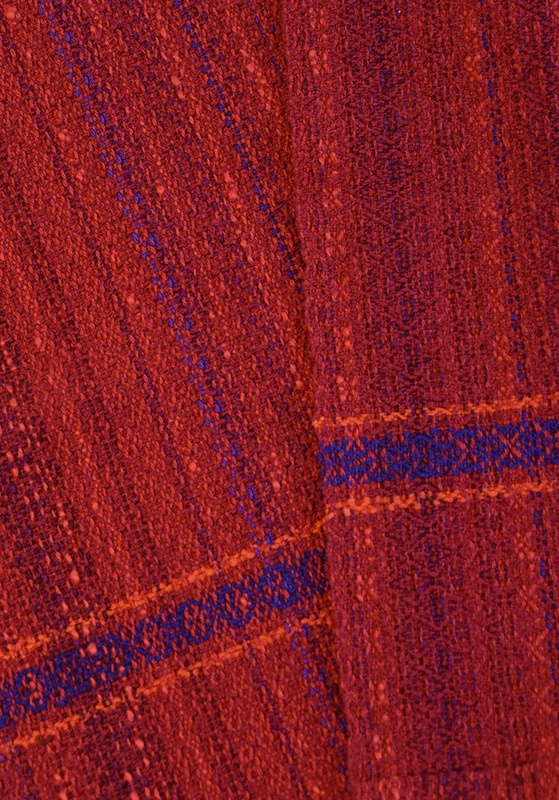 A similar pattern shows up in some red and blue towels. 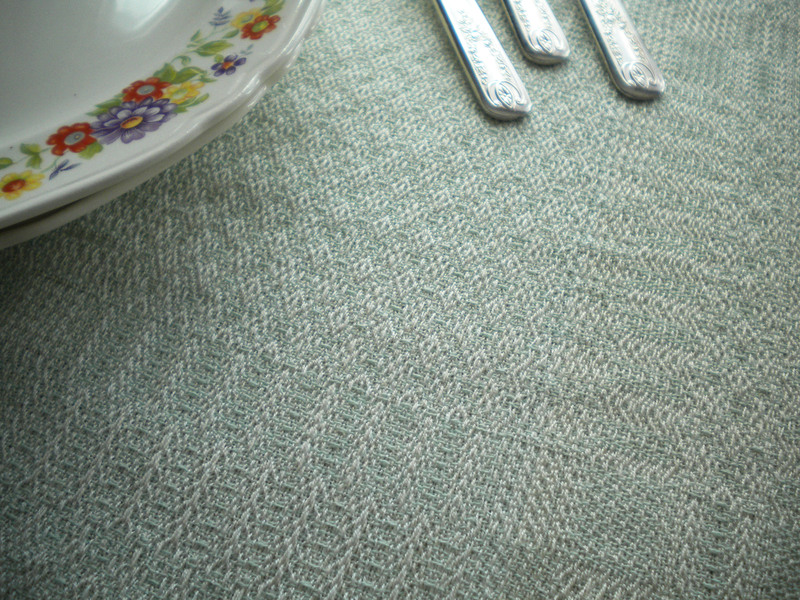 There are the double weave placemats with repeating blocks and ovals. 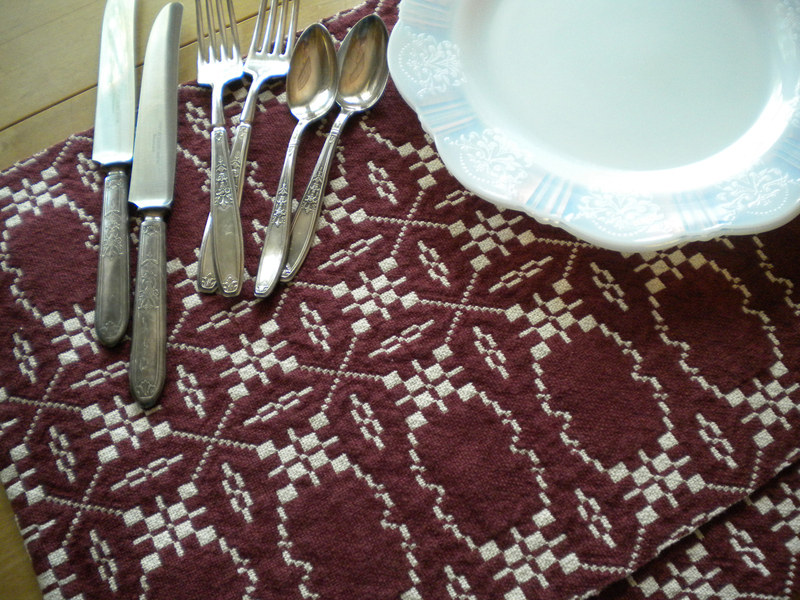 And then there are the small table cloths sporting diamonds, stars, and blocks overall. 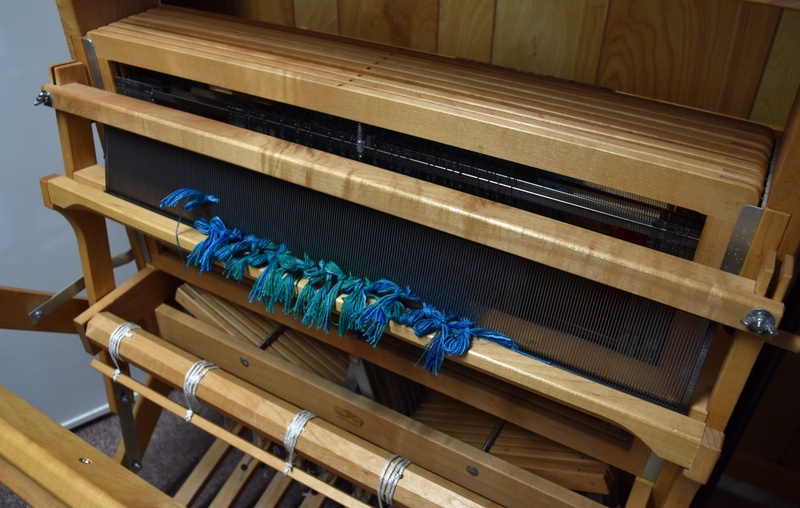 Right now I have a towel warp on the small loom and my mind wanders while I’m throwing the shuttle. 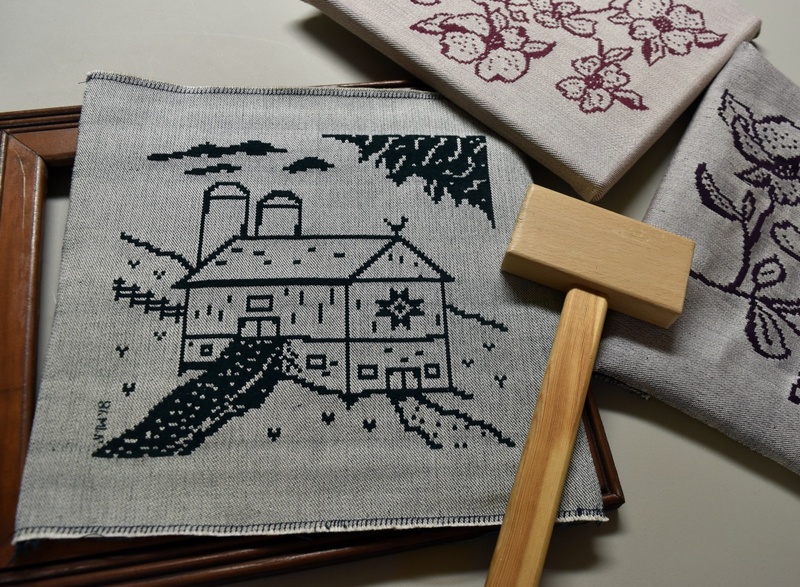 What can I put on the drawloom that will be more than an exercise in sampling? How can I adapt the elaborate fancy twills from the 18th century Snavely manuscript into something delightful for the 21st century? 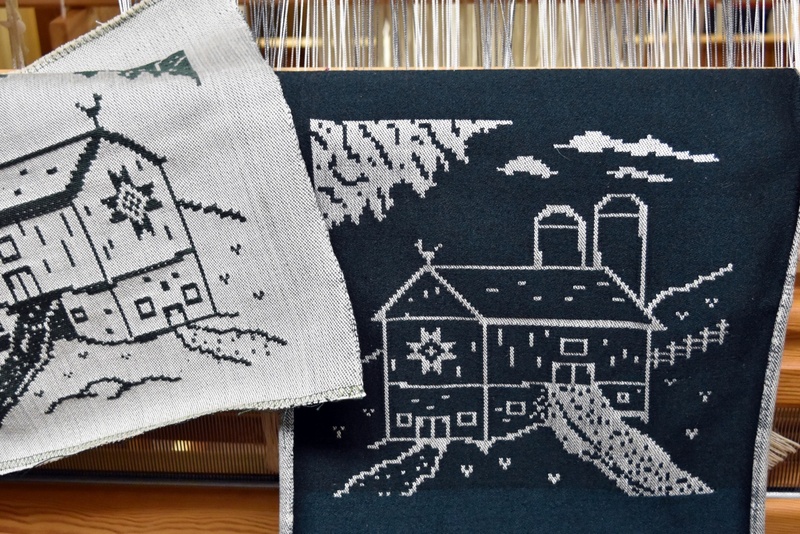 Is there room in our clear-the-clutter culture for decorative textiles? So my mind wanders. 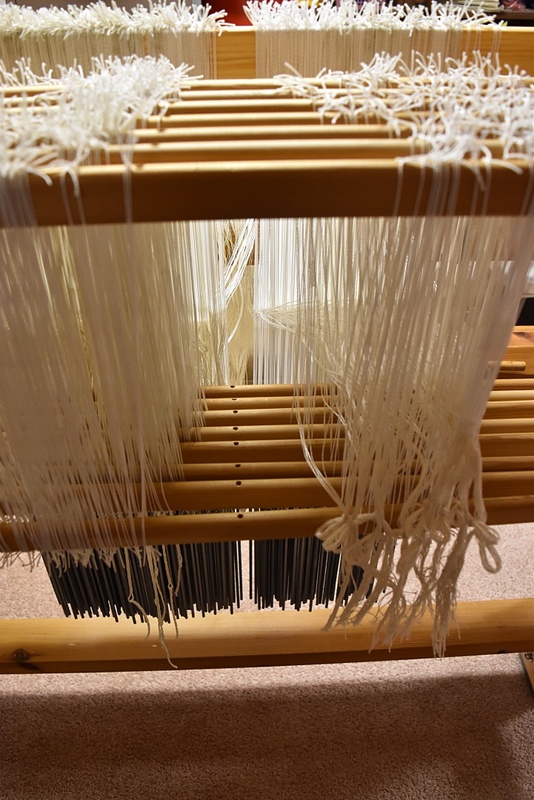 I think a point twill on the 12-shaft loom is beginning to take shape. 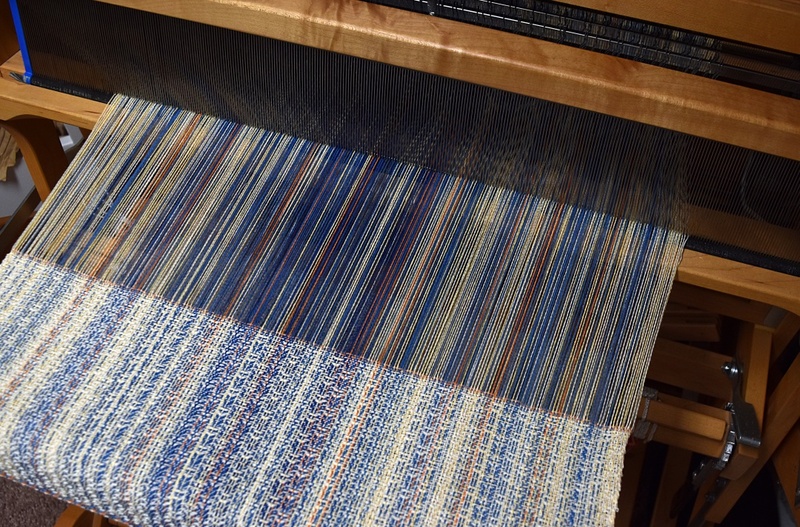 Do the colors I pick for any given project follow my mental directions in the warp and weft? Do they express my ideas of what that fabric should look like? Do they “play well with others”? Laura took the audience through several exercises demonstrating how our perception of colors is affected by all the other colors around them. Putting a purple patch over a white background or a blue background affects how that purple looks. Our eyes will “see” it as different when it is actually the same. Watching her exercises, I recalled a “problem child” cone of yarn I have that doesn’t play well with others. It’s called “Bluebird” and by itself, is a delightful purple which leans toward blue. But just try to blend it with other purples or even with reds and it becomes either a bully by standing out like a neon light or is itself bullied into a non-descript gray. I can blame some of this on my camera or my lighting, but this cone of yarn is often the culprit when I can’t get a towel to photograph well. It’s a case of the background color either highlighting the accent or pulling all the color out of it. What I need to figure out is the happy medium. Don’t forget the holiday specials going on in my Etsy shop. I am offering 10% off on any orders over $75. Just enter the code HOLIDAY18 at check-out. And if you order on today, November 26, your treasure will ship for free. UFO as in “unfinished object.” I noticed this week how very many of these are lying around my studio waiting to be finished. I started framing the three damask pictures I wove for family late last winter. In my defense, I’ve been undecided until recently just how to frame them, and now I just have to … finish. There’s the basket of cottolin towels woven in…hmmm…maybe May? They are ready to be hemmed, just waiting. There’s also the “new” towel warp put on while I waited to hear about a yarn order. 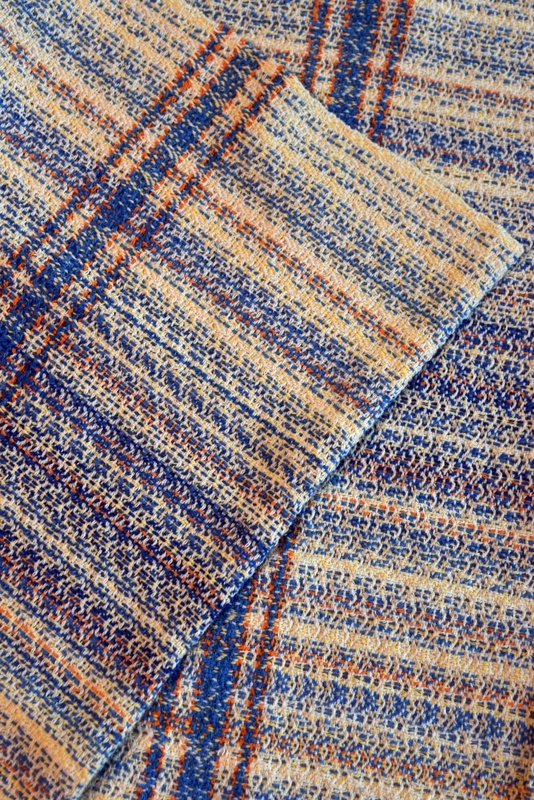 Two towels woven, seven to go. 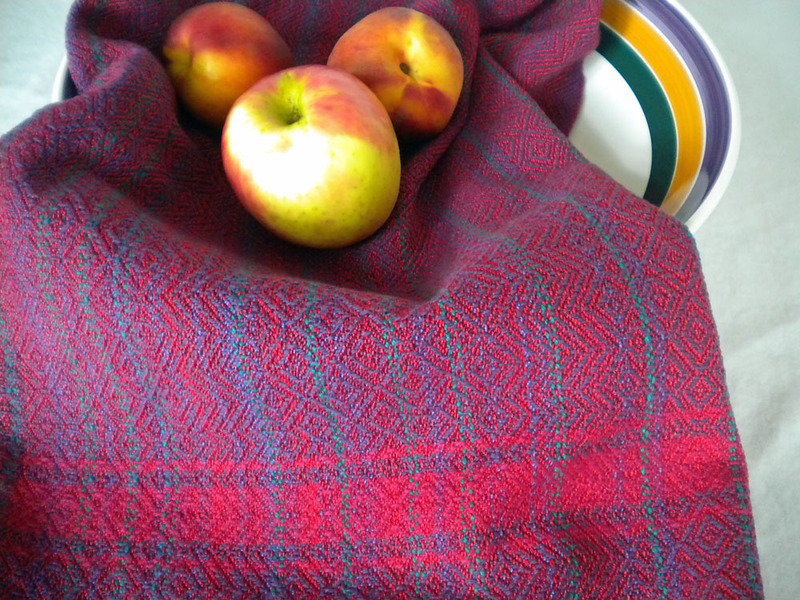 Then there’s the doubleweave placemats that necessitated the said yarn order. These are on the loom and are my current focus since it’s a set order. And there’s the agreement to weave an opphämta wall hanging with winter motifs, in the vein of the hangings I wove last summer. This one is not even on the loom yet, but it’s committed. Not to mention the millennial braided rug, visited only sporadically because it is such a learning experience. Or the two knitting projects that sit next to my couch for evening relaxation. UFOs are not bad things really. Each project moves at its own pace and if I have to wait for something on one project, it’s good to have another to work on. But there is a tipping point. It’s time to wrap up at least some of these UFOs — so I can start some more! Do you have any UFOs waiting for your attention? We’ve all had them—challenges that derail the day, slow down the process, defy expectations. It’s the picture that turned out squashed. 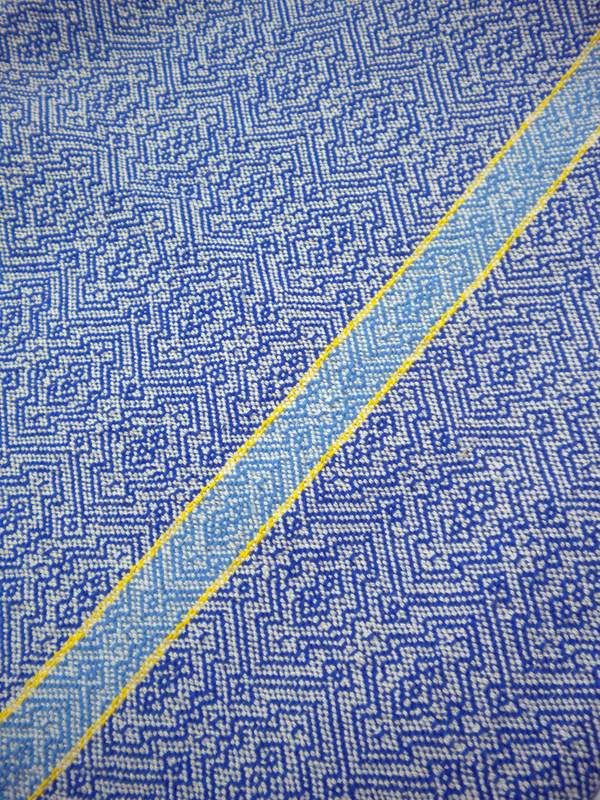 Or the warp that wasn’t quite long enough for that last towel. 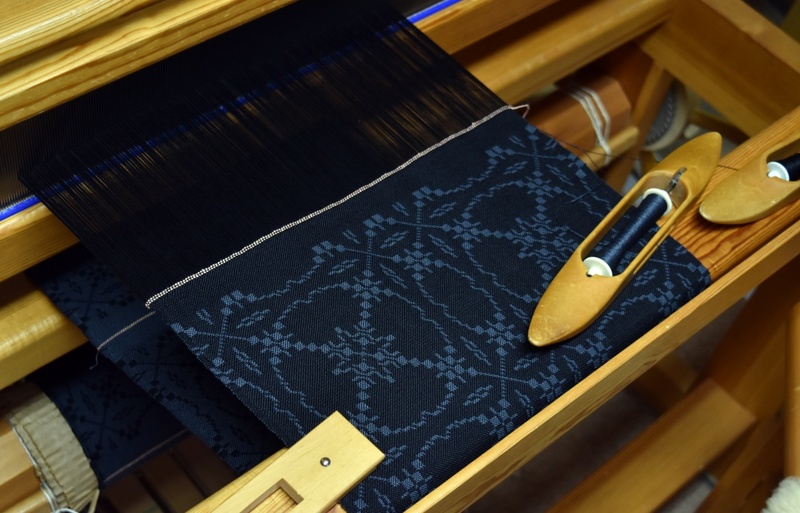 Or the blanket that came off the loom in a flourish only to reveal a treadling error in the middle. It’s a “glass half full vs. glass half empty” way of looking at things but without those learning experiences, we’d miss so many serendipities! This spring I’m experimenting with some structures and experiments are all about seeing “what if…?” It’s a learning experience on purpose. For the first time that I can remember, I actually wove a “gamp.” My dictionary defines gamp as a large baggy umbrella, used humorously. 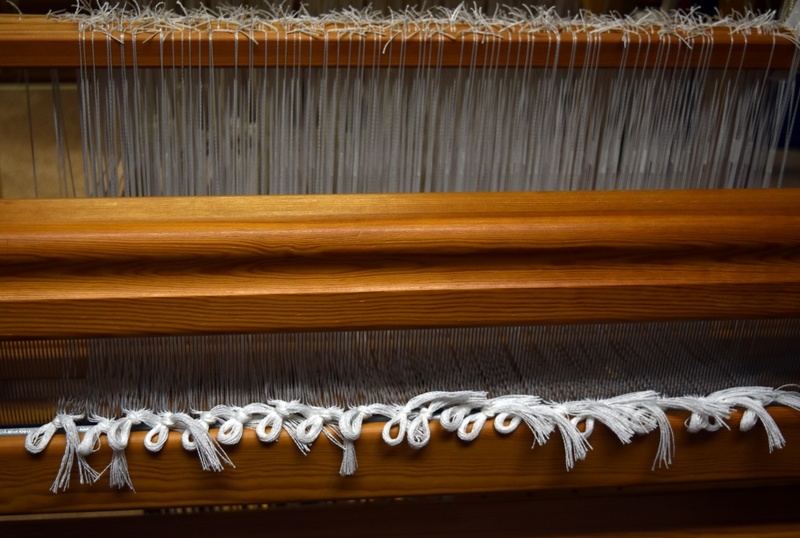 In weaving terms, a gamp is a sampler: thread 4 or 5 different threadings and colors, treadling as drawn in. It’s a fun way to try out different looks. 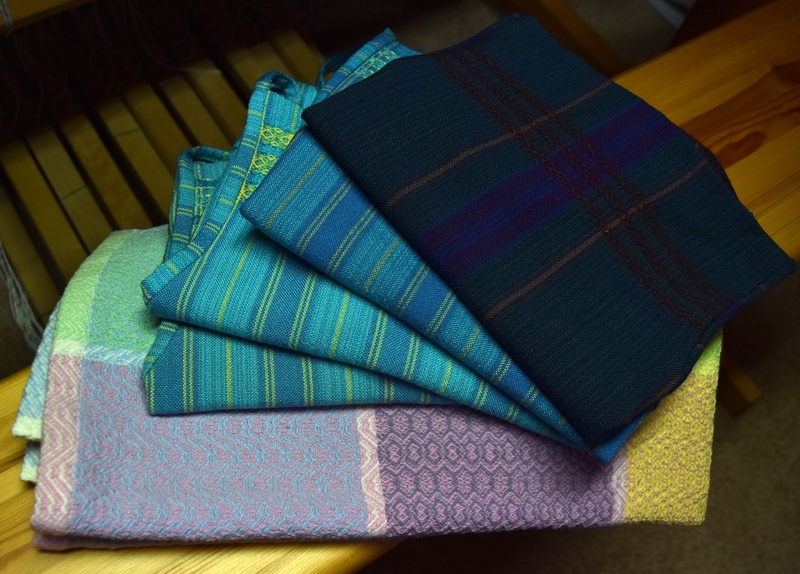 My baby blankets sported 5 different colors in 5 different 8-shaft twill threadings and treadlings. Fun! Except for that pesky treadling error right in the middle of the middle block! Learning experience. Perhaps that blanket will be cut up into bibs. Perhaps I’ll keep it as a twill reference. 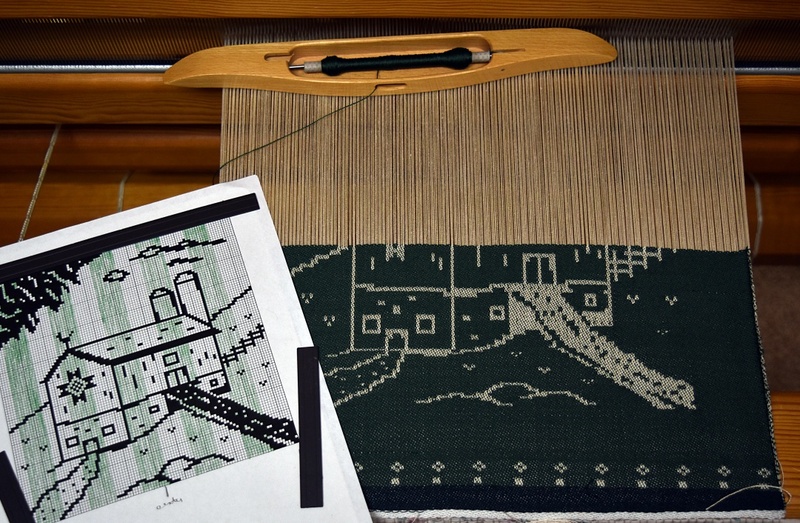 I’ve read in Alice Schlein and Bhakti Ziek’s The Woven Pixel (2006 Bridgewater Press, available on Handweaving.net) that to get the woven picture to truly reflect the graphed design, you have to adjust the size of those little squares to the proportion of your weave structure. 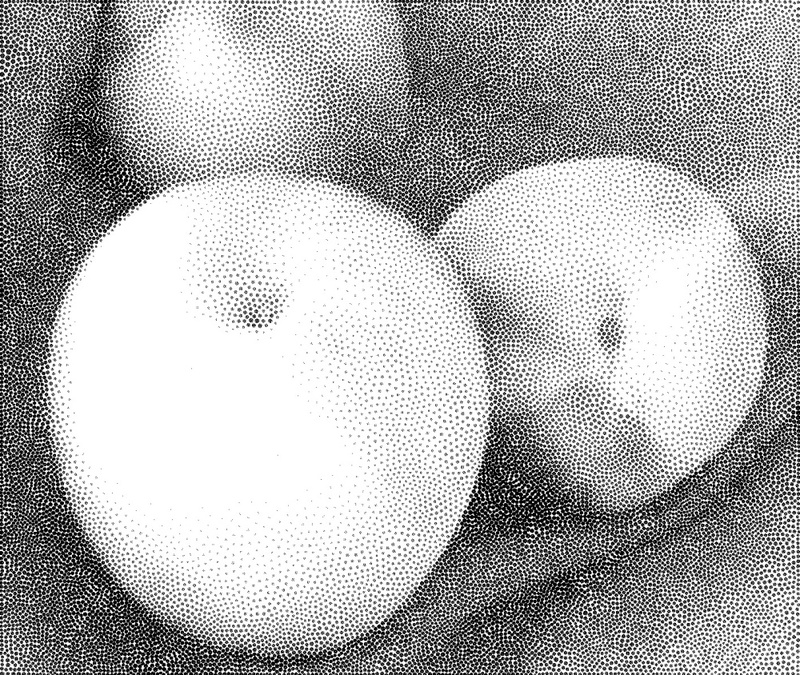 While their discussion was aimed at computerized weaving, I adapted their advice to my simple sketchpad drawing, making the squares – well, less square. 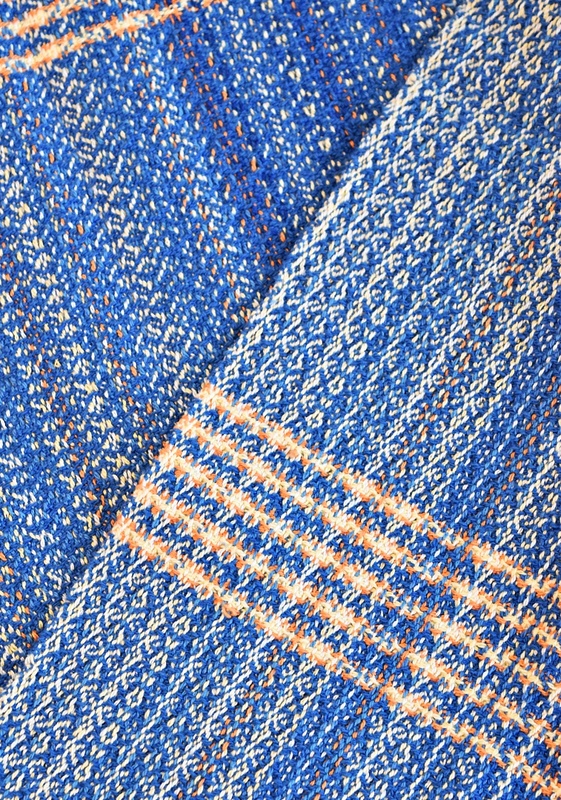 After all, how many woven fabrics are perfectly balanced warp to weft? After three or four more tries, I’m closer to the proportions I envisioned. And along the way, I played with different elements in the actual design. Slight differences, but all adding to the whole. I’m learning to slow down on my assessments. So what if I ran out of warp for a towel? Can it still be woven up into something else—a napkin? 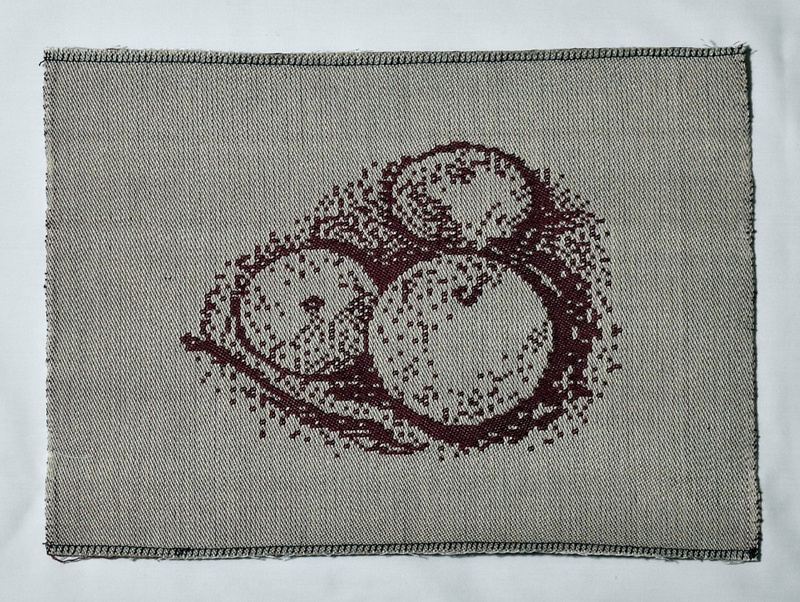 A table mat? A wash cloth? 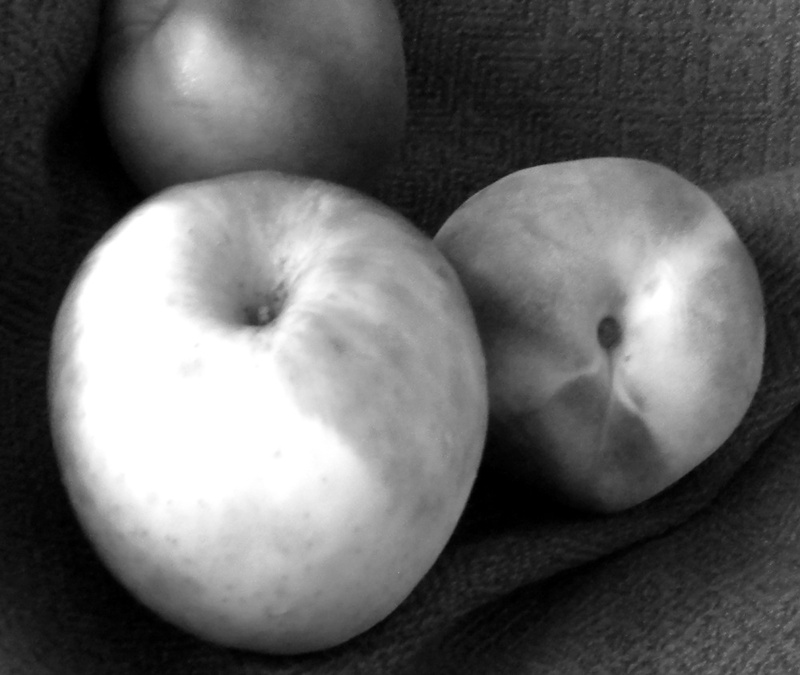 It’s a fallacy to expect a project to turn out perfect on the first try. I share this because I don’t think I’m alone here. As makers, we have this ideal we aim for and if it doesn’t turn out like that ideal, we feel like it’s a failure. Not so! Sometimes we have to walk away from it for a while in order to look at it with different eyes. I’m learning to walk away for a bit. Give the warp time to tell me what it should be. Try it with your next challenge. And enjoy the learning experience! Pleasant thought, the speech of the tool. What a lovely way to describe design well-conceived, craft well-done. Authors from earlier generations certainly had a way with words! The editor who wrote that line, W. R. Lethaby, is referring to good design. 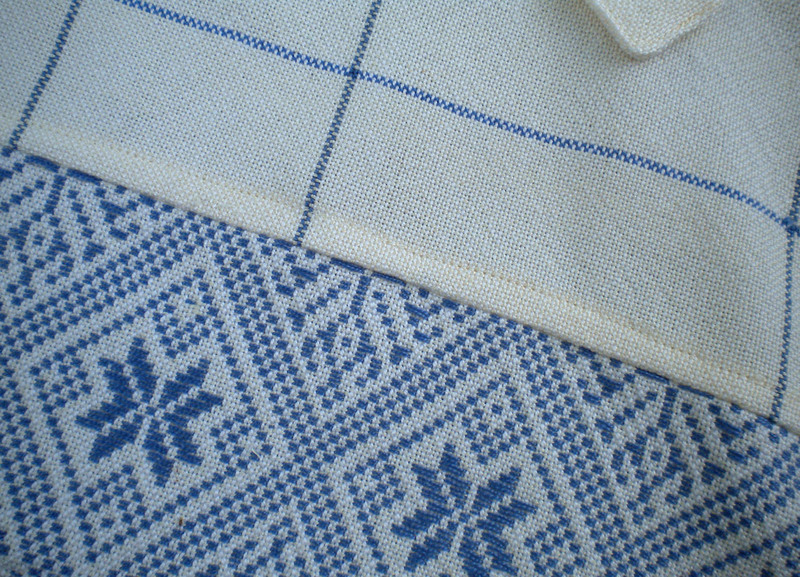 He penned his view in the late Arts and Crafts period in his Editor’s Preface to Hand-Loom Weaving Plain and Ornamental by Luther Hooper (Pitman and Sons, 1925 available on Handweaving.net). It reflects the value of traditional craftsmanship but his premise is still well worth considering. 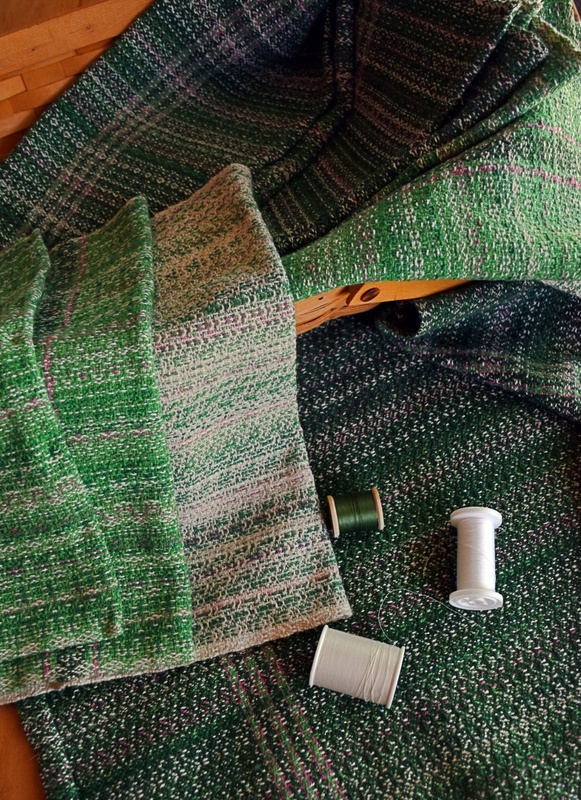 I can weave warp after warp and be technically sound in the weaving, but if I don’t put some thought into the design—color, structure, presentation—it will inevitably become tired. It’s no longer “pleasant thought.” My weaving has to grow. There are many definitions of good design. What I consider good design may differ from your perspective, but across the spectrum of definition, something that is well-conceived, well-executed stands out. The tools we use may differ, but they all express our sense of design. 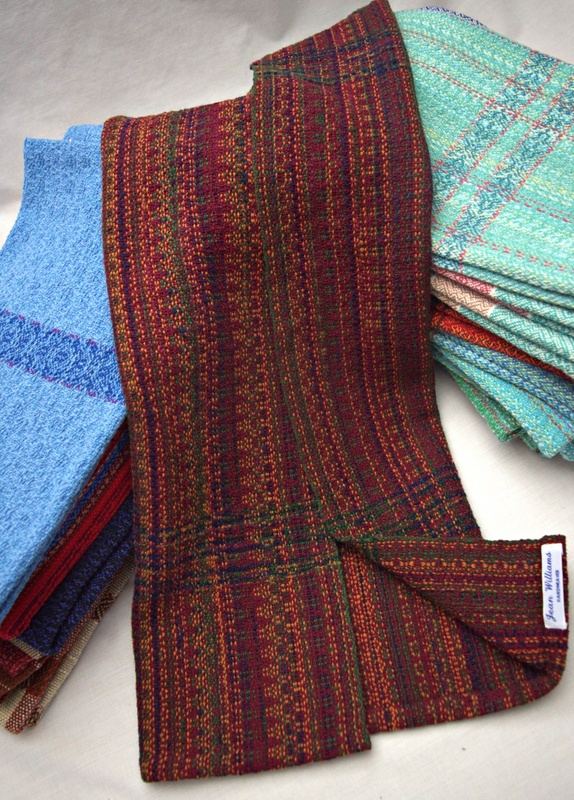 This concept goes way beyond what to put on the loom next or what to offer in a sale line. This can – and should — inform our whole design process. My weaving springs from what I find pleasant. My tool is the loom. What tool do you use to express your pleasant thought?